Aside from being the deepest and one of the largest muscles in the body, the psoas is often overlooked and misunderstood when considering strengthening the core. The psoas sits on each side of your lumbar spine where it attaches to the vertebrae and stretches over the hip joint and attaches at your femur on the inner thighs. The psoas is very active. It facilitates the movement for every step you take by pulling on your leg at your inner thigh. 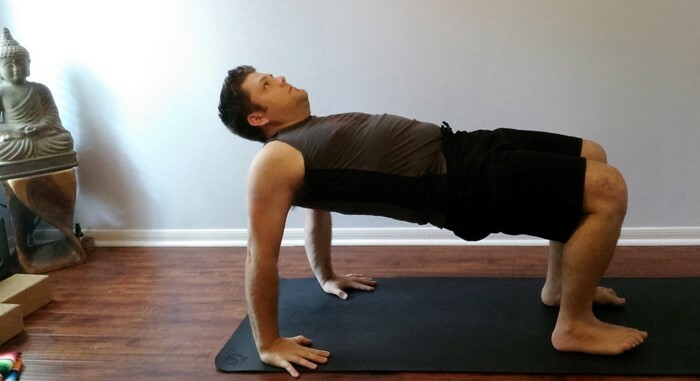 When you bend forward, it works in conjunction with your abdominal muscles to flex your spine. 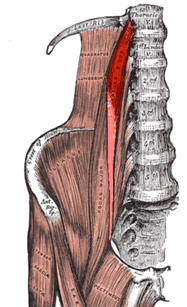 And most importantly, the psoas aides the structure and support for the impact absorbing curvature of your lower back. 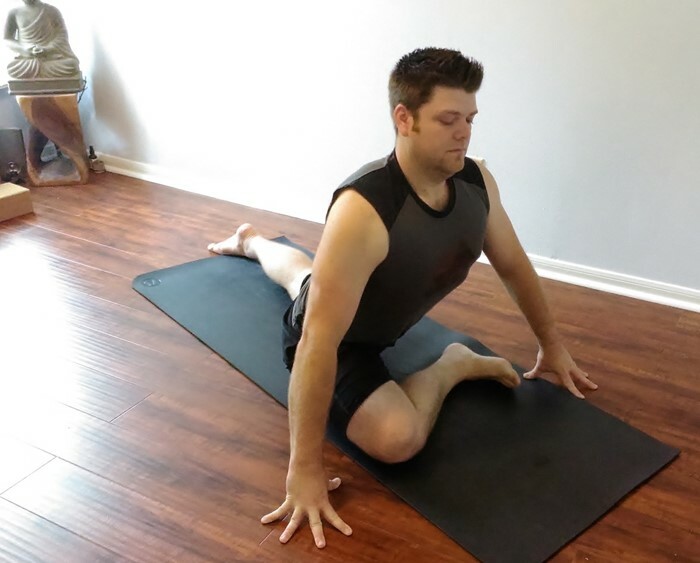 Focusing on psoas care and maintenance is important for any yoga practice as well as a supplemental strengthening program for other forms of exercise. The problem is twofold. Conventional ab exercises target only the superficial abdominal muscles, while the muscles we need to strengthen are much deeper. Secondly, not only do we need to learn to properly strengthen the psoas, but we must also learn to safely lengthen without arching the lower back too deeply to begin accessing some of the more intermediate and advanced poses in yoga. The ‘core’ is a label that refers to the four main components of the abdominal muscles. The outermost layer is called the rectus abdominis. This layer is the well-known superficial layer that forms the sought after six-pack look in the tummy. 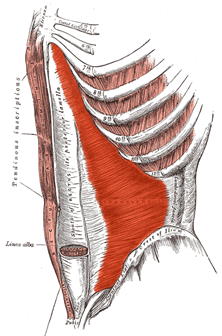 The transverse abdominis in the 2nd layer. This layer is responsible for the bracing action of the abdominals. The sides of the abdominals are referred to as the obliques and actually are made up of the internal and external obliques. These muscles support and facilitate twists and side bends. 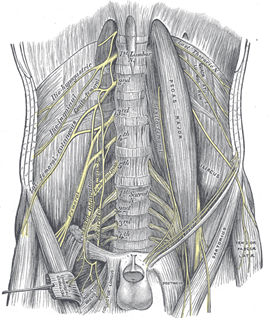 And at the deepest layer, you will find the psoas muscles. Below are illustrations, from the top down, Rectus Abdominis, Transverse Abdominis, Psoas Major, and Psoas Major and Minor in relation to the Illiacus. The following images are from the works of Grey’s Anatomy and are available for use in the public domain. The intention of consciously strengthening the psoas is to create balance and harmony with these 4 main muscles groups of the core. In yoga, I often encounter students with really strong transverse abdominis but often they will have a weak psoas. The main disadvantage of a weak psoas comes at the cost of your lower back health. Without a strong psoas, the lower back rests under extreme pressure and often is accentuated by a deep lumbar curve. To get an idea of how the psoas engages as well as a good indication of psoas health location in the body, you can get a partner to help with this exercise. Lie on your back with knees bent. Bring the knees hip distance apart and raise the legs so that the thighs are vertical and the shins are horizontal. Interlace the hands behind the head. Your partner will place their hands on the tops of your knees with fingers resting on the thigh slightly above the knee. As your partner pulls your knees away from your torso, your job is to keep the legs immobilized. As your partner continues to pull the knees, your back will begin to lift off the floor. Resist the urge to curl the torso up. This will defeat the purpose by using the rectus abdominis. You want to stabilize the upper body and the legs and rely on the strength of the psoas to lift the upper body through the stability of the lower body. Another disadvantage comes to those trying to tone their physique, yet never accomplish that flat belly. Ironically, this is sometimes due to an imbalance in the core resulting in an anterior tilt in the pelvis. The result is a posture that causes the tummy and its contents to protrude forward over the waistline, giving the body a ‘beer belly’ appearance. Unless this postural scenario is exacerbated by other factors, focusing on a balanced core workout can bring the pelvis into proper alignment and cultivate a ‘belly-in’ posture. There are two techniques that you must be aware of in your yoga (or other exercise) as well as any day to day activities. These two techniques will not only begin to hone your awareness on the psoas, but they will train the four main components of your core to become integrated and work together more harmoniously. The easiest way to become familiar with this sensation for this technique is on your back. Lie on your back and place your fingers on the bony protrusions on your hips. With the backs of legs lying on the floor, keep the legs straight as you being to hover your heels just an inch off the floor. Now explore the area between your hip points with your fingers. This contraction happens in the transverse abdominis, cinching the area between the hip points like belt or a drawstring. Release the feet back to the floor and notice the muscles in that area relax. Create the same muscular action without lifting the feet off the floor. Practice this anytime you have the opportunity so that you learn the technique of engaging the muscles without action or movement. One of my long time teachers uses the cue, “Engage the lower abdomen like you’re zipping up your tightest pair of skinny jeans”. I must say that upon observing the class, it is easy to see all the muscle activation. So I know this cue translates well into the body. The contraction you are performing in the core when you mimic this action happens in the rectus abdominis. The rectus abdominis connects the pubis to the lower ribs (inserts at the xiphoid process and costal cartilages 5 thru 7 and originates at the pubic bone). By contracting the rectus abdominis, the pelvis is tilted to the posterior as the pubis bone moves in and up towards the navel. In some circles this is known as ‘knitting the ribs’ as the contraction occurs in the area between the lower ribs down to the lower belly. As you become in tune with the harmony of these two actions, the zip up technique will stabilize the pelvis lengthwise and the cinch up technique will stabilize the lumbar spine. With this stability, the psoas can do its work without pulling the lumbar vertebrae too deep into a lumbar curve and exacerbating lower back issues. 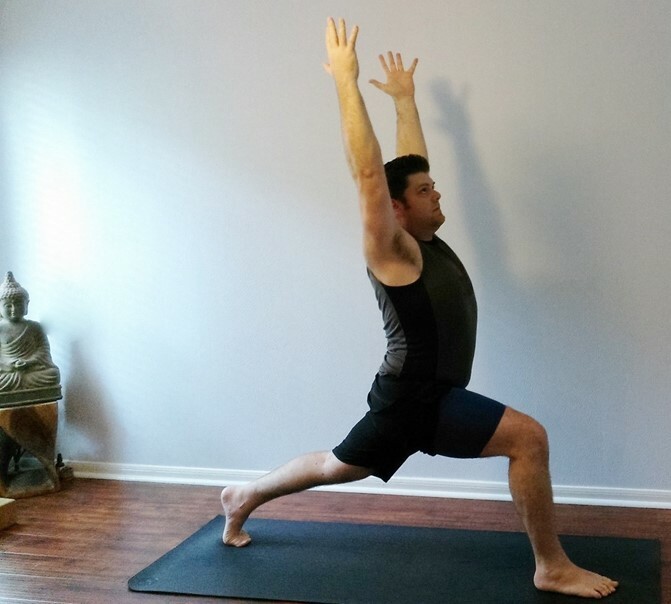 Cultivate these muscle actions in each pose and experiment with the new-found stability. Once you have identified the psoas and have become well versed in engaging the different muscles in the core, experiment with these engagements in some of the basic yoga poses. If the following asanas are part of your typical routine, don’t go as deep into the poses as you normally would. We’re still focusing on awareness in the core and the health of the psoas. Lie on your back with your left leg on the floor, extended with toes pointed up. Place a strap around your right foot and lift your right leg slightly towards your torso. Before moving the leg any closer to you. Tilt the pelvis so that a small arch appears in the lower back. Begin to cultivate the techniques to engage the rectus abdominis and transverse abdominis as you keep the muscles of the left leg engaged. Slowly bring the right leg towards your torso without losing this engagement in the core. Hold for a few breaths and repeat on the other side. Start by lying on the front of your body. Bring the elbows under your shoulders as you would in sphinx pose. Curl the toes under and lift your hips. Engage the muscles from your feet all the way into your core to create a straight line in the body from the head to the toe. If the hips are sagging and there’s an arch in the back, brace through core and engage the rectus abdominis by using the zip up technique. Keep the muscle engagement in the shoulders, the core and the legs and breathe for 5 to 10 breaths. Stand at the back of your mat and take a long strep forwards with the right foot. Turn the back foot in slightly. Before taking the hands up, build the foundation of the pose and engage the core. Lean forward slightly and engage the transverse abdominis by using the ‘cinch-up’ technique to engage the area between the hip points. Notice the stability in the front leg as the inner thigh moves in towards the pelvis. As you lift the torso and reach the arms up, engage the rectus abdominis by using the ‘zip-up’ technique. These two actions keep the pelvis stabilized so that as you reach the upper body higher out of the pelvis, your psoas gets a healthy stretch. Resist the urge to let the abdominals go and to arch back. Keep lifting higher through the hands and the crown of the head. Stand at the top of your mat and take a long step backwards with your left leg so that your right leg is forward in a high lunge. Utilize the drawstring action to bring the belly in as you keep the left leg straight and engaged. Keep that and lower a little deeper into the lunge. Keep the engagement in the abs and the legs and slowly being to reach the hands up. As you rise through the hands and move the hips deeper into the pose, use your awareness on the core to find a balance between the psoas and the other abdominal muscles. Hold for 10 breaths and repeat on the other side. 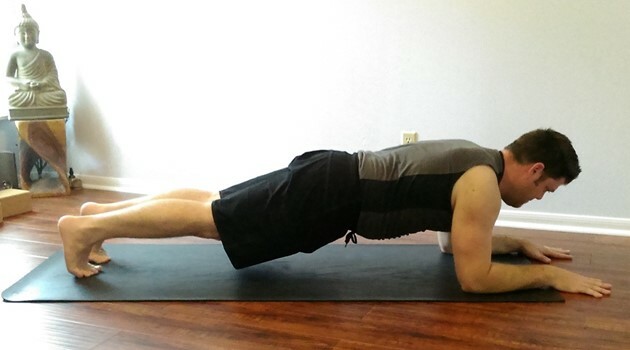 To come in to reverse tabletop (upward facing plank), sit with your knees bent and feet hip distance apart. Place your hands behind you with your fingers pointed towards your sit bones, about hip distance or wider. As you draw your shoulders back, tuck your chin and lift your hips on an inhalation bringing your hips to the height of your knees. 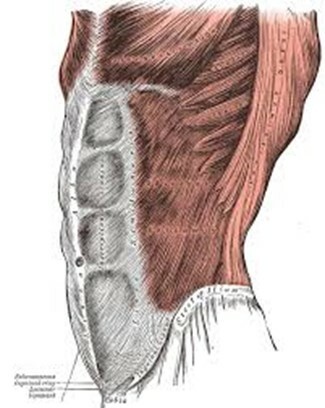 If it feels like the lower belly is protruding, isometrically hug your heels towards your hands and squeeze your hip points together as you would in the cynch-up technique and engage the rectus abdominis using the action of the zip-up technique. Keep this engagement as you breathe for 5 to 8 breaths. I find that pigeon pose is great for lengthening the posas, but there is so much action happening in the pose, students often overlook engagement of the abdominals. And as we know, without the abdominals engaged, the psoas will often dominate the engagement of the core, leaving the rectus abdominis and transverse abdominis out of the equation and creating an imbalance in the core. Come onto hands and knees and bring your right knee behind and to the outside your right wrist and align right heel with the left hip point. Bow forward and extend through your left leg as you active the transverse abdominis by using the cinch up action. From the feet engage the outer legs up to the pelvis. Hold that muscle activation and from the inner knees up to the inner groin, widen the thighs apart without actually moving the legs. Focus on holding the muscle activation in the legs and the transverse abdominis and then slightly engage the transverse abdominis by hugging the belly in and up as you would in the ‘zip-up’ technique. Now slowly begin to lift the torso up by pressing into the hands. As you do this, keep your awareness on the balance and the harmony of the core to prevent any one part of the core from releasing or letting go. Keep the breath slow as you hold for 10 or more breaths and then slowly lower and switch sides. The Psoas muscles need better illustration. Try BiodigitalHuman.com. The Videos help. Interesting article, nonetheless. (08/15/17).